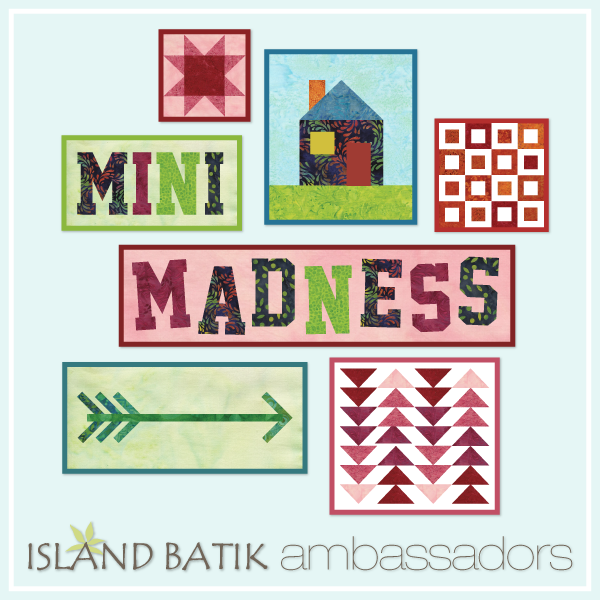 My Mini Madness challenge quiltie. and create something that's no bigger than 24"x24". AccuQuilt GO cutter that's been collecting dust in the corner. With a little playing I found that I could indeed make it work, 1 handed. It just seemed to fit that peek into spring, we are all so desperately awaiting, here in the USA. I cut my pieces with my favorite new tool, the Fiskars rotary cutter combo, that I've been talking about. You can see in my sashing, that it does a pretty darn good job. I'm not sure I cut that straight when I had 2 good hands! LOL!! No fancy quilting, that I promised myself I was going to work on this year. It was my first shot at one handed free motion! But I did do some fun playing on the back, with switching out bobbin threads. Anything to entertain! 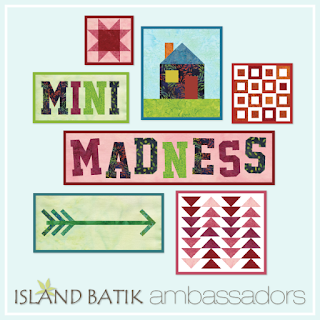 Hope you have enjoyed my little "Mini Madness". I just love passing on great sale information. I stumbled on it the other day. 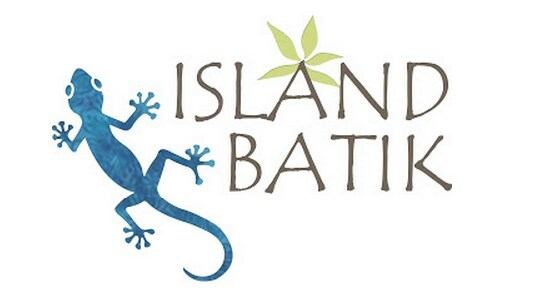 Batik as low as $6.99 a yard! My credit card was quivering! Now I'm patiently ...or not so patiently awaiting for them to arrive! Love the flowers. Great job on the quilting. The changes in bobbin color does make for a fun backing. great mini, nice die too, you need to crank out more GO kits while you have your hand in a cast! That would be cut for the front door after Easter. So glad to see you sewing and quilting. One-handed FMQ look pretty good. Cute mini to welcome Spring. 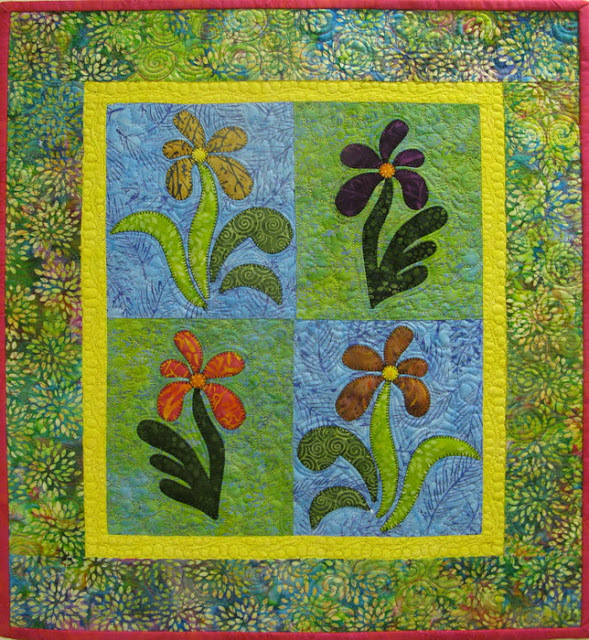 Really lovely quilt and great quilting! Wow! One-handed too! You are amazing! Beautiful Joan and I am amazed at what you are accomplishing one handed!! Thanks for the heads up on Hancock's of Paducah! It's just so adorable and perfect for spring! I am impressed with your one handed abilities. This is very nice. I can't imagine cutting one handed let alone QUILTING one handed. And the quilting is so good. You must be great with 2 hands! 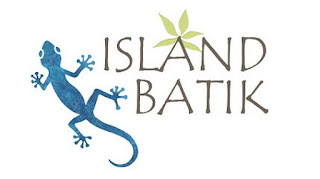 I was at Hancocks of Paducah in Feb. and bought some of the Island Batik 1/2 yard precuts in greens, purples and neutrals at a great price! Can't wait to get into them. I have to order some yellows now. Great result with the mini. Smart idea to use the Go Cutter as that can be used with a cast on. The colours and design are lovely. It must only be a few days now? ?